Mikhail Robert began studying violin and classical guitar at the age of 8, this was the beginning of a passionate love affair with the classical guitar that has lasted his entire life. Being a luthier requires more than the ability to assemble classical guitars. It requires the ability to be an historian, to possess passion for the purest sound, to love music and above all, to yearn to share it. 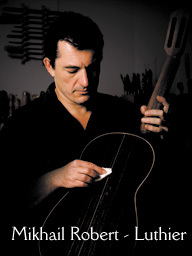 A great classical guitar resonates as much within the audience as within the player. It becomes the bond between them, a feeling that is shared, where the music flows from artist to listener. An intimate gift, a mingling of souls. It is our goal at Robert Guitars, that each finely crafted instrument carry the capacity for such magic.